Hello. I'm Annette Britcher, of Mathnasium of St. Catharines, your neighbourhood math-only learning centre. We help kids in grades 2-12 understand math by teaching the way that makes sense to them. It has helped with my daughters confidence with math and she no longer thinks there is something wrong with her because she did not understand how they were teaching it at school. I do recommend more teachers. Lately there seems to be one teacher for a lot of kids or opening on Sundays. Thank you for what you have done for my daughter. Our grandsons last math test - 90% Very pleased and he is very happy. His confidence is building. Thank you. Dominic loves coming three days a week. He likes the challenge and is getting a great foundation in math. My son says that all of the people who work at Mathnasium are kind. I have seen improvement in his math skills (doubles, combinations to make 10). My daughter, grade 6, feels much more confident in the idea that she CAN learn math. The daily struggles in the classroom are less concerning when you see how quickly she is now learning. We were hooked on day 1 when John said, "you don't hate math, you hate the way math makes you feel." My daughter felt very understood in that moment. Thanks John! My daughter is very shy and low confidance ....quite timid as well! She asks to go and feels better when she does! Lives the young staff and loves Jon! Thank you!!! Our son really enjoys math and is not challenged enough in school, so we attend Mathnasium to keep his brain engaged. Mathnasium has become our after school “sport” for our math wiz! The kids love the place. The kids love John and the rest of the team there. Everyone is helpful and a great atmosphere for learning. My son thinks it is a fun place to go! Our son Aidan has been attending Mathnasium for almost a year and has exhibited tremendous progress both in his math skills and confidence level. 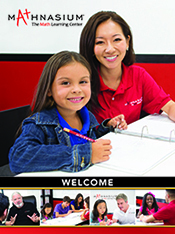 I would recommend Mathnasium to any parent who feels that their child may need extra support with math. Mathnasium has transformed my child's approach to math. Typically a source of high anxiety, math has now become a source of confidence and ease for my daughter. We've gone from speaking to the teacher about her struggles in math to speaking to her teacher about being the top achiever in her math class. Remarkable program and phenomenal tutors and Management. John's approach is warm, sincere and patient. Everything you need when tackling math. Thank you! Our sons have enjoyed attending Mathnasium since first meeting John and the staff. Mathnasium’s way of teaching math in an understandable way was apparent on our very first visit. Our children can easily explain to us what they have learned, which suggests they comprehend the material very well. It’s flexible scheduling and great location make it easy for any busy family to enjoy. Anyone needing some additional assistance with math, or simply loves math and craves its challenges needs to check out Mathnasium. We really love Mathnasium's. My daughter has expressed how "cool" they are. They have assissted her in viewing her math in an alternative manner. John has been great and the staff very nice and dedicated. Great people and help! John and the staff at Mathnasium St Catharines have been absolutely amazing! My daughter Hannah has always struggled with maths, now in grade 8 she was stressed out about going to high school next year,in just one month she feels like she can do more, no more counting on her fingers, learning her timetables, it's all making a difference. My son is comfortable going to Mathnasium center and willing to learn new concepts. Mathnasium has been a great resource for my children to enhance their math skills and gain confidence. Our 15 year old was struggling with academic math this year and Mathnasium allowed him to get better than a pass! John and his crew were very patient and respectful - our boy wasn't jumping for joy to go but he didn't resist it either and was interested in learning! A very different experience than another tuturing service we used that was a fight to get him to. Grade 10 academic math is a horrendous challenge! Our son went to Mathnasium twice a week and they had a designated tutor who knew their stuff! When he started, he had 35% and no clue...all we wanted was a pass and he passed with flying colors! We are very appreciative and the big part is he went willingly every time! Thank you John and yeh Mathnasium staff! I could not have been more impressed with the dedication everyone showed to help my son catch up after an extended illness. John went above and beyond by dedicating instructors and even opening early one day to accommodate our schedule. Everyone at Mathnasium was wonderful, warm and attentive. If there is ever a need for math assistance again I would not hesitate to sign any of my children up. Thank you! My son loves it and wants to stay longer every time. He wondered why school couldn't be like Mathnasium. Magnesium tutoring is the best I’ve come across. They are understanding, compassionate and do whatever they can to help my son. I don’t know what I would do without them. They are accommodating and understanding with my anxious and is not able to come. I appreciate and thank them for all they have done. The tutors were very helpful and patient. They helped our child very much. Our son is in grade 10 and has really been struggling with math. We have tried other tutoring programs and he hated them. He goes to Mathasium willingly and feels he is accomplishing something. No arguments about it and he feels he is really starting to understand. We are very grateful for Mathnasium and wished we found it sooner. Thank you. Mathnasium has been an exceptional experience for my son. He walked out of his first session saying he never knew math could be so fun. His report card arrived recently and for the first time, there are no C's and even an A- which is another first. After years of frustrating repetitive math memorization, he is now starting to understand the basic concepts and to enjoy math. Thank you Mathnasium....we so appreciate your program. I’ve never seen kids so happy to do schoolwork after school. My son loves it. He was worried about going and feeling stupid. He genuinely enjoys it, loves the staff too. He really wants some Mathnasium swag but he is too busy saving his achievement cards for a LEGO set! You may use my first name but not last.